Gayle Batt is the kind of lady who throws elegant cocktail parties while wearing layers of silk chiffon, dripping pearls, and eight months’ pregnant. She is the kind of woman who says “anyhoo” and calls everyone “Dahlin’” or a special pet name. With hair, makeup, and nails always done to perfection, she triumphs rather than crumbles when infidelity, alcoholism, cancer, or any form of adversity attempts to shatter her family. Endearing and enduring, Gayle is a big-hearted, strong-willed true Southern belle—and she taught her son everything he knows about being a man. 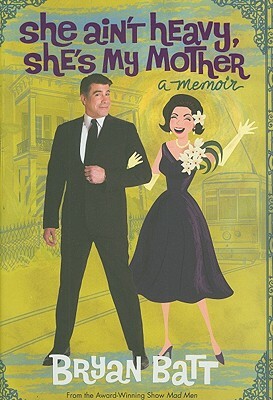 In She Ain’t Heavy, She’s My Mother, Bryan Batt, the actor who plays Sal Romano on the Emmy, Golden Globe, and Peabody Award–winning Mad Men, chronicles his life—and his mother’s supportive presence in it. From growing up gay below the Mason-Dixon Line to landing principal roles on Broadway (his first was on roller skates playing a singing and dancing boxcar in Starlight Express!) and later on the picture-perfect sets of TV’s Mad Men, to opening the ever-popular Hazelnut boutique in his hometown of New Orleans with his partner, Bryan weaves a touching and hilarious story of the South, showbiz, and an unshakable bond between mother and son. BRYAN BATT appears on the Emmy Award-winning drama "Mad Men "and has performed in many Broadway and off-Broadway productions, including "Jeffrey, Starlight Express, Cats, and Beauty and the Beast. Hazelnut, the home-accessory shop he owns with his partner in New Orleans, has been featured in the "New York Times," "House Beautiful," "InStyle," and other publications.